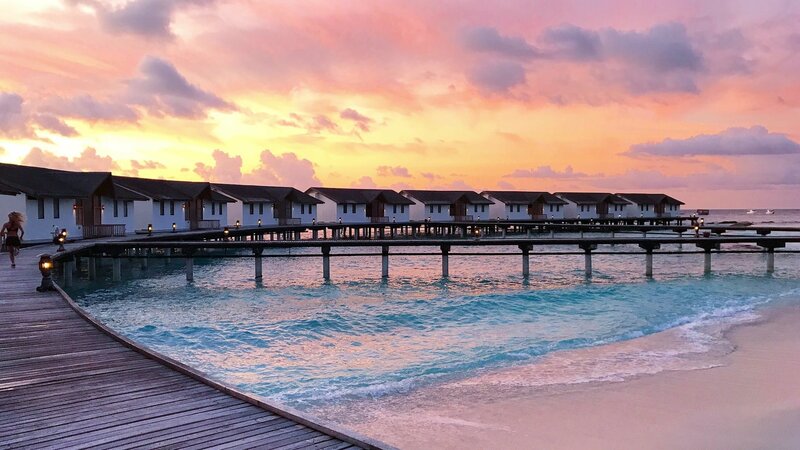 If you’re looking for a tropical paradise to escape to for a holiday bursting with sunshine, crystal clear waters, relaxed island vibes, consistent warm temperatures & stunning coral reefs, then look no further than the Maldives. 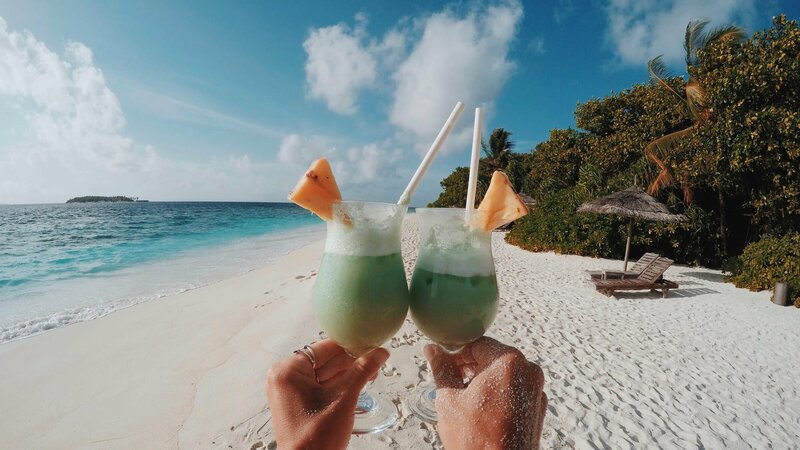 After 6 weeks travelling through Europe, we had a spur of the moment decision to change the final part of our itinerary and head to the Maldives. Whilst Europe was a great adventure & we definitely had fun, we didn’t necessarily find it relaxing. It was more “travel” verses a “holiday” and we really wanted to switch off & completely relax. So there we had it: Destination Maldives. 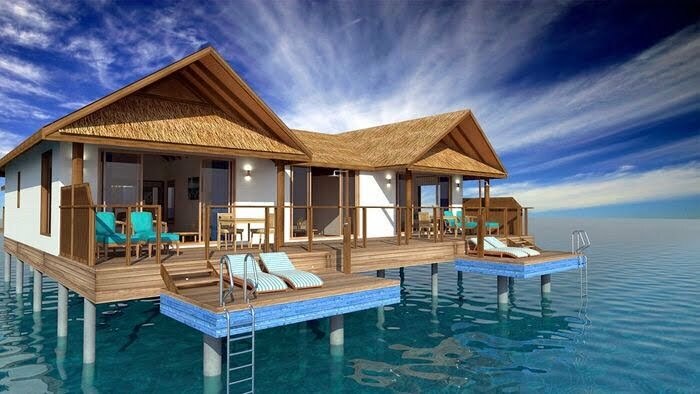 The Maldives is comprised of 1192 coral islands grouped in 26 atolls in the Indian Ocean. Atolls are ring shaped reefs that were formed when volcanoes subsided and sea levels rose. The Maldives boats year round air temperatures of 29C to 32C and consistent balmy water temps of 28C. It houses over 2000 species of fish and 200 species of coral, which can be seen when snorkelling or scuba diving. After researching all the travel sites to decide which of the 1192 islands to stay on, we couldn’t go past Reethi Beach. We have been to the Maldives before in 2013, 2014 & 2016, each time staying at Reethi Beach, and we couldn’t find anything that compared. As soon as we stepped off the sea plane onto the soft white sands at Reethi Beach, I knew we had made the right choice. I felt instantly relaxed. The calm blue waters lapping on the shore soothed my soul. I was home. (If you want to find out more about the island, click here to read my previous blog). If you’re planning a trip to the Maldives, here is my list of suggested things to pack. This is based on my holidays at Reethi Beach Resort, so if you are visiting another island too, make sure you check the specifics with them. Cozzies & lots of them – I basically lived in cozzies for a week, so having a few pairs is handy. If you plan on snorkelling, take cozzies that will stay on well when swimming and diving. Snorkel Gear & Flippers – we took our own snorkel mask and flippers to ensure they fitted and were comfortable. However, snorkel gear hire is available from the Dive Centre at Reethi. Extra Tooth Paste – bring a spare tube of tooth paste and use it to stop your snorkel mask from fogging up. Simply squeeze a drop onto the lens, run it around with your finger, let it sit for a few minutes & then rinse it off with water. Viola. Go Pro / Underwater Camera – the sea life is stunning & it’s worth investing in a camera to capture it. Hat & Sunscreen – when you’re spending all day living it up in the beautiful, a hat and sunscreen is important. First Aid Kit – it’s not uncommon to get minor scratches from the coral, so bring a first aid kit for this. There is also a doctor based on the island. Loose Island Clothing – the warm, consistent temps of 28C – 32C coupled with the humidity means light clothing is perfect. Reethi had a relaxed vibe and there is no need to dress fancy. Runners – Reethi is the perfect island for keeping fit & healthy, so pack a pair of shoes you can use to go for runs around the island, use in the gym & play tennis and squash in. A book – for some chill time while you soak up the Maldivian sun. Heels – girls, don’t bother bringing heels or fancy shoes. Reethi has sandy paths and is a barefoot island. Suits – guys, don’t bother with long pants or suit jackets; it’s shorts and t-shirts/singlets all the way. 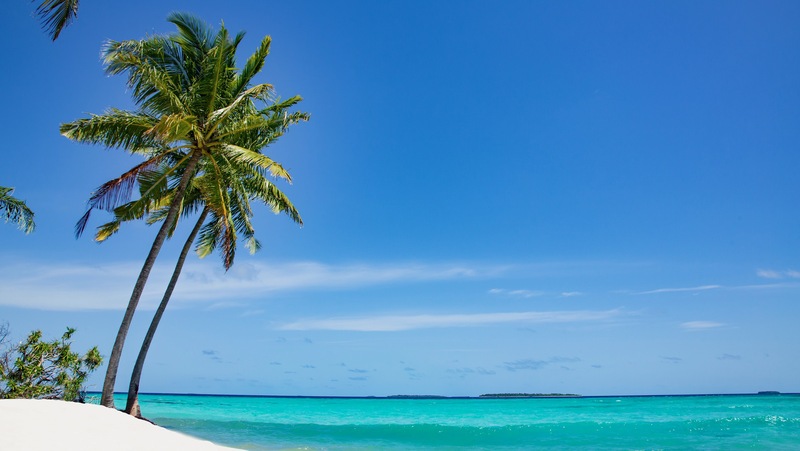 Beach Towels – these are provided at Reethi. Food & Water – the chefs at Reethi Beach make the most incredible food you could ever eat! With an endless buffet at breakfast, lunch and dinner, you definitely won’t be needing extra food. And Reethi has a no-waste policy, so it’s best not to bring plastic water bottles. You can’t drink the tap water on the island, but you can get glass bottles of filtered water each day. Destination Maldives: Where to Next? 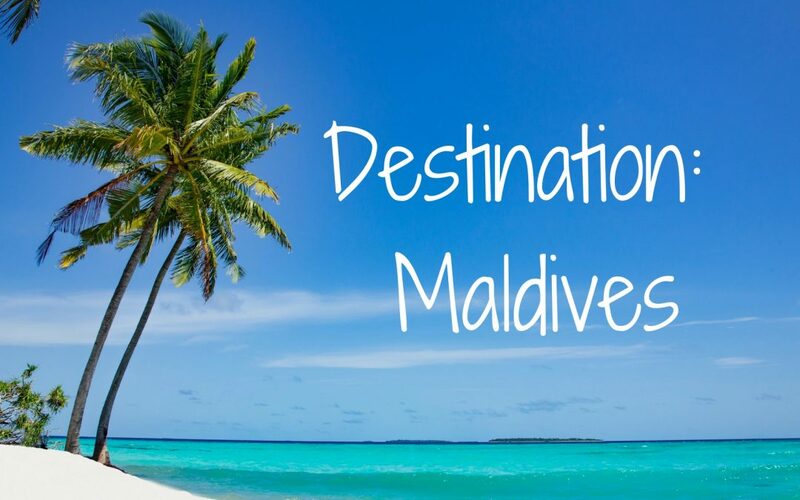 After a week in the Maldives & clarity of thinking, we decided tropical holidays are the way to go for us & we have already selected our next Maldivian Destinations. We will return to Reethi Beach (of course!) and we will also visit Reethi Faru, a brand new 4 star resort & sister island to Reethi Beach, which will open 1st November 2017! Reethi Faru is located in the unspoilt Raa Atoll and is surrounded by the most stunning white beach, coconut groves and lush vegetation. We had the privilege of taking a boat trip to see the island which is just stunning! It’s a place of true natural beauty and is named after its beautiful house reef; Reethi Faru, means Beautiful Reef. Just like Reethi Beach, Reethi Faru will be a barefoot island with focus on environmental sustainability. It will have 5 restaurants, including the main buffet which I can’t wait to try, especially as the incredible head chef from Reethi Beach will be designing the menu (inside goss), plus a two storey sports centre, spa and much, much more. Editors Note: This post was not sponsored but I was given a discounted rate for part of my stay at Reethi Beach.